I fell in love with Le relais Venise L’Entrecote steakhouse in Paris during our trip last November. We knew there was a reason the line was out the door on a cold and rainy day. Average wait time 30min. When my travel buddy heard about the opening in New York, we made reservations asap for opening day. When I arrived 15 min early, around 6:30pm, the dining room was surprisingly empty. Still they insisted on waiting for my whole party to arrive, it was just 3 of us. 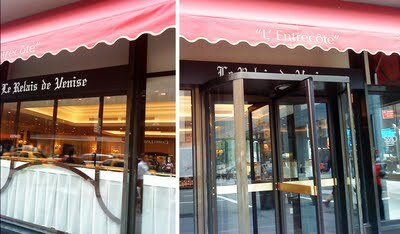 I was fine with that, but a bit in awe that no other foodies, Paris lovers, French countrymen were lining outside these door for a taste of rue Bonaparte. Crowded or not, we were as excited as can be. Our expectations were high, we were looking forward to reliving our Paris dinner in every little detail. The warm decor and the colorful tables and walls – check. Bright yellow napkins – check. Waitress dressed as french maids with a bit of the french attitude on the side – check. Good house red wine for very reasonable price – check. Simple no frills menu of salad, steak and fries – check. The meal starts with a salad, fresh lettuce, toasted walnuts and a mustardy, slightly creamy and tart dressing. We loved it in Paris, and this was identical. Now to the grand event, and what made this chain an icon in Paris, then London and Barcelona, the steak. There’s no choice of size, quantity or cut, just blue, rare, medium or well and 2 servings per person of a strip steak (roughly 6-8 onces, I’m really not good with measurements so I apologize in advance). I like mine rare, anytime there’s good steak, I think rare is the way to go. The waitress comes out with the steak and fries on a hot platter for the whole table, and then serves it individually, very generous side of fries. Once your finished with your first plate, she comes with your second serving of steak and some more fries. This is no steak the size of Texas, so the concept might need some getting use to for most americans, but I like the “normal” serving size, this is the amount we should be eating anyways, you leave perfectly satisfied and not overly stuffed. The sauce is what makes it unique, don’t you dare think about A1 (personally when I see that slathered on a good piece of meat, it makes me mad). It’s a highly guarded secret recipe. I tasted olive oil with heavy handed butter, mustard, some herbs (thyme), a hint of curry. I read that there might also be chicken liver or marrow involved. 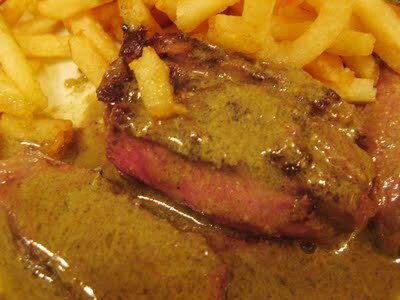 The steak and sauce was a mirror replica of Paris, it’s been months since our first experience, and some debate of whether the meat was better overseas arose, nevertheless, it’s was undeniable, that the unique marriage of tender juicy steak and secret sauce was a success. Some might find the sauce a tad bit oily, but I think in small quantities is ok, plus the flavor alone is enough to die for. The fries on the other hand, very very disappointing, on the soggy side and extra oily. I guess that’s why it’s called “french” fries, this couldn’t compare. For dessert, we ordered the same ones we had in Paris, but the Peach Melba (one of our favorites wasn’t available). 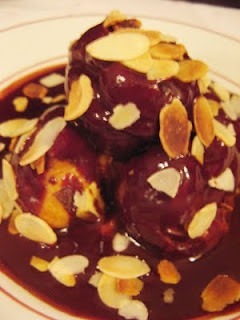 Fortunately the Profiteroles were, these round bite size cream puffs come in a pool of dark chocolate sauce and almonds. You bite into the soft pastry and get a burst vanilla ice cream, then the warm dark chocolate and crunchy slivered almonds appear… hmmmm… so heavenly and luscious. It’s not too sweet and portion is good enough for sharing, but I would rather have my own. It’s different from all the steakhouses around, if your taste buds are feeling numb from the usual steakhouse by now, this is a good place to awaken them. The prices are very fair – $24 for salad, 2 servings of steak and fries. Desserts are around $6.50. House red wine for an unbelievable $20. Trust me you can’t go wrong. I’m giving them some time to improve the fries, then again everything else is so outstanding, I can overlook that. I really hope this concept works in NYC and this place stays around for a long long time. It’s hard to find a classic place that follows tradition and never veers from the original recipes. You're really on a roll! Keep it up. That sounds fantastic. Does the Paris one take reservations? I don't think so. I absolutely HATE when restaurants make you wait for everyone to be there before seating you. It's not a good way to start an evening. They're lucky you don't hold grudges. What the deal with "2 servings per person" and "the second round"? They serve whatever was left from the serving dish? I don't get it. But I think I'd like to. Nope, the PAris one doesn't take reservations either. I hate to wait to be seated when the restaurant is not crowded!!!!! i mean, there were 3 tables max with ppl! ridiculous! I was surprised at the Modern the other night though, the place was packed, I got there 20min before my reservation and they offered to seat me, that's the way to start an evening! There's always 2 servings per person. I think it's roughly 6-8 ounces combined (I'm not very good with measurements)… So the waitress serves everyone once, and after your done, you get your second serving. Does that make sense? After reading your review, I think I'm going to try this restaurant. =) Do you think recommend us to go on a weekday in a group of 6? Or it would be too long to wait for a table?? =D thanks for writing this review, it's really helpful! The idea is that you are only getting one steak, but they keep half of it back so that they can keep it warm. That way you get to enjoy all of it at peak temperature!